Audacious and genre-defying, Black and Blue is seeped in melancholy, in the feeling of being blue, or, rather, black and blue, with all the literality of bruised flesh. 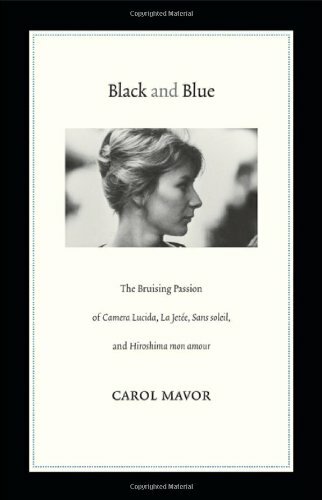 Roland Barthes and Marcel Proust are inspirations and subjects of Carol Mavor's exquisite, image-filled rumination on efforts to capture fleeting moments and to comprehend the incomprehensible. At the book's heart are one book and three films, Roland Barthes's Camera Lucida, Chris Marker's La Jetée and Sans soleil, and Marguerite Duras's and Alain Resnais's Hiroshima mon amour, postwar French works that register disturbing truths about loss and regret, and violence and history, through aesthetic refinement. Personal recollections punctuate Mavor's dazzling interpretations of these and many other works of art and criticism. Childhood memories become Proust's 'small-scale contrivances,' tiny sensations that open onto panormas. Mavor's mother lost her memory to Alzheimer's, and Black and Blue is framed by the author's memories of her mother and effort to understand what it means to not be recognized by one to whom you were once so known.